Vintage Voyageur is a cozy home located in the town of Grand Marais just up the block from the Grand Marais Harbor. This vacation rental home is conveniently located close to downtown Grand Marais and many North Shore adventures. Vintage Voyageur is a 2 bedroom, 1 bathroom home located in the town of Grand Marais, MN Located just a block away from the Grand Marais Harbor and Voyageur Brewing Company. Great views of Lake Superior can be enjoyed from the front yard. The couch has room for the whole family to sit back and enjoy movie night. The spacious living room includes a flat screen TV with a DVD/VCR- great for enjoying a family movie night on a rainy summer evening. Sit with a good book in front of the window and even do a little people watching. The bonus desk area is great for guests who need to work during their stay- great for extended stays The full sized kitchen is well-equipped for preparing a home cooked meal during your stay. The living room and bathroom are located just off of the kitchen in the back of the home. The kitchen also has a nice dining area- great for enjoying your home cooked meals. The space is large and has enough room for more than one cook and for friends and family to chat at the table. Seating for everyone at the kitchen table- perfect for family game night, too The first bedroom has a queen bed. The window allows plenty of natural light to cheer the room up. Plenty of closet space allows you to unpack and really enjoy your stay. A cozy room for a good night`s rest. Nestle in and unpack in the full closet or dresser. This east facing room sparkles with the morning light. Enjoy the large vanity in the bathroom- perfect for getting ready for your North Shore adventures. The bathroom features a shower/tub combo. This four season sunroom is perfect for games, art projects, reading in the afternoon sun or happy hour festivities. Sunroom leads into the kitchen. Consider Vintage Voyageur for your next Grand Marais vacation if you want to be in the heart of town. Here you are easy walking distance to downtown and the Grand Marais Art Colony which is just up the street. Sit under the trees in the summer to enjoy the shade and catch a glimpse of beautiful Lake Superior. The views are great from your front yard sitting area under the trees. The back deck is great for sitting during the summer while reading a book or spending time with family. Enjoy the fire pit in the backyard for roasting marshmallows. Vintage Voyageur is in a convenient, lively location in Grand Marais. Come and enjoy small town life. At Vintage Voyageur you will find yourself in the heart of the quaint and peaceful town of Grand Marais, MN. Located just a block from the Grand Marais Harbor and the Voyageur Brewing Company and down the street from the Grand Marais Art Colony. Vintage Voyageur is a great location and easy walking distance to everything in Grand Marais. Vintage Voyageur is a 2 bedroom, 1 bathroom, 1 story home located right in town. From The North House Folk School to locally owned ma and pa shops that make this small town so unique. There are also half a dozen restaurants and bars just a few blocks away. The local library, YMCA, and several parks are also within walking distance. You could easily arrive, park your car, and never have to use it again during your stay! However, if it's an adventure that you seek, you've come to the right place! Vintage Voyageur is centrally located to so many outdoor activities available on the North Shore that you could come for a month and still find that you haven't done everything. Head down the shore 10 miles to Cascade State Park where you will find a beautiful waterfall after a short, easy hike. Up for more of a challenge? Just head 15 miles up the shore to Judge C.R. Magney State Park for a 1+ mile hike which includes several flights of stairs to view the mysterious Devil's Kettle waterfall. Here, half of the Brule River flows down a typical waterfall and out into Lake Superior. The other half goes into a mysterious hole and disappears- and no one knows where it goes! Add in miles and miles of hiking, biking, skiing, snowshoeing, and snowmobiling trails and you will find adventure all year long during your stay at Vintage Voyageur. At the end of a long day, come on home and head out to a local restaurant or cook a family meal in the full kitchen. Enjoy it in the dining room or out on the back porch. Then watch the sunset by the harbor from the front yard and roast marshmallows in the firepit in the back yard. Say hello to those passing by - locals and tourists alike - and feel like you truly belong in this beautiful little town. Rental process went very smooth & professional. Instructions for every aspect were covered in the information sent, and also posted in the house. We saw a few negative comments about having to take the garbage & recycling when we left, but it was not a problem. Instructions were clear & received in advance. The drop off in Lutsen was easy to find. House location is superb - we walked everywhere in Grand Marais - to eat, shop & view harbor. The house furnished everything you could think of needing (even night lights - a small thing, but something I always bring along). We were reluctant to go without TV for a week, but it was a blessing to take a break from electronics, and more relaxing. The house was extremely well equipped, spotless and in a terrific location. We loved being able to walk pretty much everywhere in Grand Marais. Espresso a block away was a treat. Bed was also comfortable. I sent an e-mail asking about bringing our dog and it was never answered directly. In the end, we realized that even if you had approved it, it was cheaper and better for the dog to kennel her in her usual location close to home. We are glad we did that. What a perfect location for a stay in Grand Marais! Perfectly clean, vintage house--sort of like staying at grandma's in the woods! The house is well-suited to three-four guests, and held up to 12 for a family feast (of Sven & Ole's pizza) with comfort and style. The weather precluded us from sitting in the perfectly placed Adirondack chairs to watch the lake and harbor, but that would have been a regular activity if it had cooperated. What a gem! This place is absolutely perfect as a home base while enjoying the north shore. It's such a short walk to downtown - Artist's point, Driftless Folk School, and all the shops and restaurants, but with the big yard and trees all around the house you never feel like you're in town. The house is one that just feels good to be in. It's a balance of modern convenience and rustic charm- everything you need and nothing you don't. And the beds- wow, I seriously took a photo of the mattress tag so I can buy one just like it. I can't recommend this place enough. I'll most certainly be back! We wanted to rent a clean place that was centrally located in Grand Marais. The Vintage Voyageur far exceeded expectations! It was so clean, so simple and so comfortable and cute! Our 2 year old was so excited about getting "her own" room she wanted to go to bed the minute we got there! We had no idea how close we would be to the harbor and the shops and we loved that part. The place was just the perfect size for our family ---Mom, Dad, big sis and baby. We definitely plan to come back next year to the same place if the sisters will share a bed. The only negative comment is we don't see the necessity of having to take our own garbage with us when the house was in town with plenty of opportunity for others to deal with the garbage. The garbage drop off location was also confusing even with the map even to us seasoned travelers. Driving 25 miles with 3 days of garbage and stinky diapers isn't a fun way to end vacation. That's the only reason we'll lower the review a little. pictures are true to what you get.. furnishings very comfortable (would have liked one more sitting chair/recliner in LR) beds comfortable, plenty of extra lines/blankets, kitchen spacious, well stocked with everything you'd need, new oven, bathroom clean-- stocked with plenty of towels. Backyard with fire pit and grill was great for 2 cook outs..back porch has an amazing breeze for an uncommonly warm afternoons in Grand Marais... we loved the off street parking, front yard with Adirondack chairs were our favorite spots to enjoy our morning coffee. Easy one block walk to Java Moose for ice cream(Java nut was our fav!) Voyageur Brewing literally across the street--great roof top seating overlooking Lake Superior, walk to anywhere downtown was so easy for us to come and go as we pleased without the worry of traffic or parking.. would highly recommend! 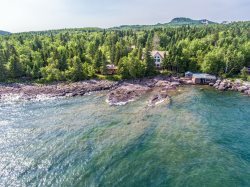 This darling house is perfectly located for access to the amenities of Grand Marais: harbor, restaurants, stores, North House Folk School, Art Colony, etc. It is small but spacious, with comfortable beds, nice linens, two porches, a fire pit, and innumerable nice touches. The staff was super friendly and helpful. What a treat to stay here, it feels like an artist's house. Very retro. Found it to be peaceful, unique, clever and whimsical. A true joy just to look around and see the neat items that have been placed in this home. Lots of windows, each looking out at something attractive. Enjoyed the fire ring in the backyard too.